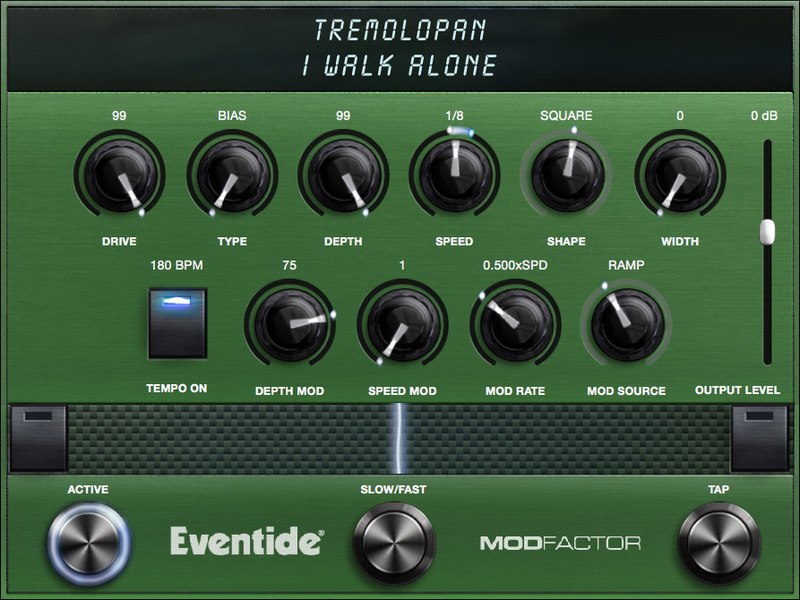 Tremolo is an effect that is created by modulating the level of the incoming audio with an LFO. Two types of Tremolo are supported – Bias [BIAS] and opto-coupled [OPTO]. For [BIAS], Intensity controls the amount of Drive. For high input levels, setting [INTENS] to high levels can cause overload distortion. .For [OPTO], Intensity controls input slew rate (Edge) and, depending on the input signal, may only have a subtle effect. Select Bias [BIAS] or opto-coupled [OPTO]. Sets the modulation sweep range from narrow to wide. Sets the modulation sweep rate. Note: If Envelope or ADSR is selected for the Shape parameter, the modulation is driven by the amplitude of the audio input and the Speed control becomes a Sensitivity control. Selects the shape (or source) of the modulation. The choices are: [SINE], TRIANGLE [TRIANG], [PEAK], [RANDOM], [SQUARE], [RAMP], Sample and Hold [SMPHLD], Envelope [ENVLPE], or [ADSR]. In addition, the Expression Pedal [EXPPDL] can be chosen as a source. When EXP PDL is chosen, the current preset’s pedal mapping is ignored. Shifts the phase of the right channel’s LFO creating a tremolo that will move from left to right in the stereo field. When set to Max, the right channel will be 180 degrees out of phase with the left creating an autopanner. Both outputs will have to be connected for this to function correctly.